Do you love to make pumpkin fudge recipes, but don’t eat any because you can’t deal with the dairy in it? Well, here’s an Easy Pumpkin Pie Fudge that’s dairy free! I love fall because I can indulge in all things pumpkin flavored. Unfortunately, so much of it from pumpkin pie to pumpkin lattes are milked based. Sure I can order my lattes with soy milk and make my pumpkin pies with tofu. But it’s a challenge to make pumpkin fudge dairy free, since fudge is usually made with sweetened condensed milk, which gives me a horrible tummy ache. Since we’re approaching Halloween, our families are going to be eating sugar and candy all the time. So I wanted to make Easy Pumpkin Pie Fudge a reduced sugar fudge. So I sweetened the pumpkin fudge recipe with powdered monk fruit, one of my favorite no calorie sweeteners. 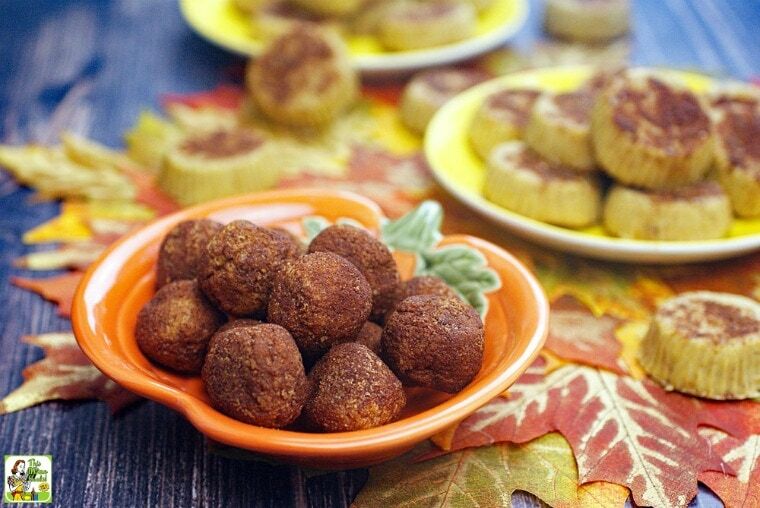 I also used powdered monk fruit in the cinnamon sugar that I used to decorate the Easy Pumpkin Pie Fudge and rolled the pumpkin fudge balls in. One of the ingredients for pumpkin fudge I recommend is sorghum syrup. Without a sugary syrup of some kind, the fudge would be too dry and fall apart. Sorghum syrup is used by home brewers and commercial brewers to make gluten free beer. You can find it at beer brewing stores or online. For this pumpkin fudge recipe, honey, agave and maple syrup are too sweet and runny. If you can’t find sorghum, a good substitute is brown rice syrup. If you wish, you can add more spices and powdered monk fruit to this pumpkin fudge recipe to suit your personal taste. 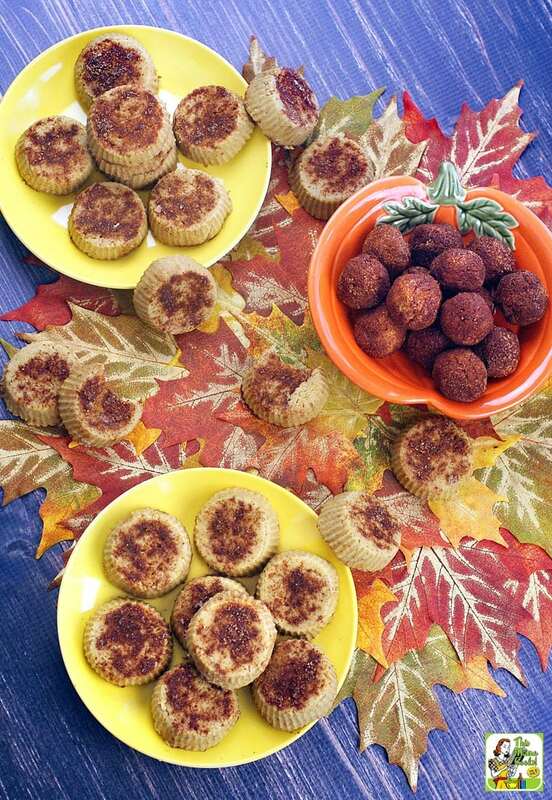 The fun thing about this easy pumpkin pie recipe is that you can make it two ways – into Pumpkin Pie Fudge Balls or Pumpkin Pie Fudge Mini Pies. Making the fudge balls is the easiest because you don’t need any extra equipment. 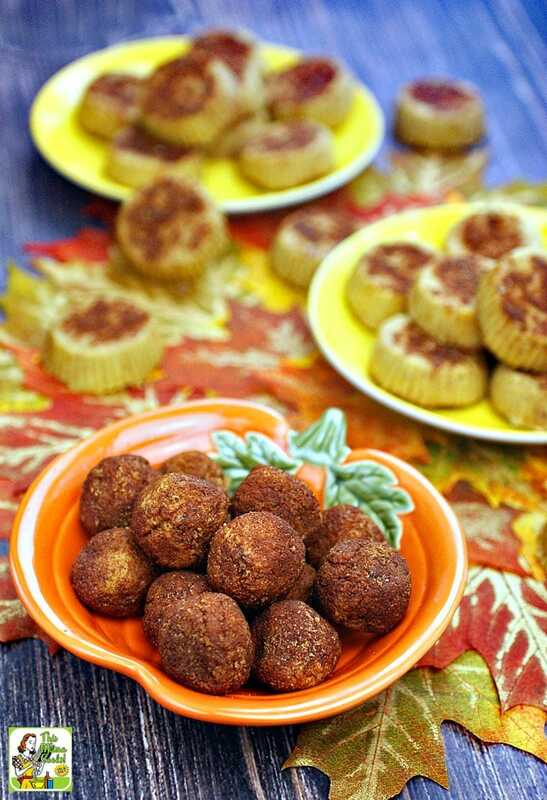 I preferred the pumpkin pie fudge balls because they had more cinnamon sugar, which complimented the pumpkin fudge. However, I love the Pumpkin Pie Fudge Mini Pies, which look a little like Reese’s Peanut Butter Cups. To make them, you’ll need a set of silicon baking cups, which are fun for baking everything from cupcakes to Hash Brown Sausage Muffins. In a medium saucepan on low heat, warm coconut butter until melted. Place heat on lowest setting. Fold in pumpkin puree, sorghum, spices, salt and monk fruit until thoroughly combined. Combine monk fruit and ground cinnamon and place in a pie plate for rolling. Using a small cookie scoop, measure out 2 teaspoons of fudge batter. Dump fudge on to plate of cinnamon sugar and roll around until covered. Place fudge balls on a dish or tray, slightly apart, and put in the refrigerator to harden up for a few hours. Store balls in a covered container in the refrigerator. Using a small cookie scoop, place 2 scoops into a silicon baking cups. Holding the baking cup in the palm of your non-dominant hand, press fudge down with your fingers until flat. Then press at the outer sides of the baking cup, so the sides of fudge are now straight up and not touching the insides of the baking cup. That way when you flip the cup over on to a tray, the mini pies will fall right out. 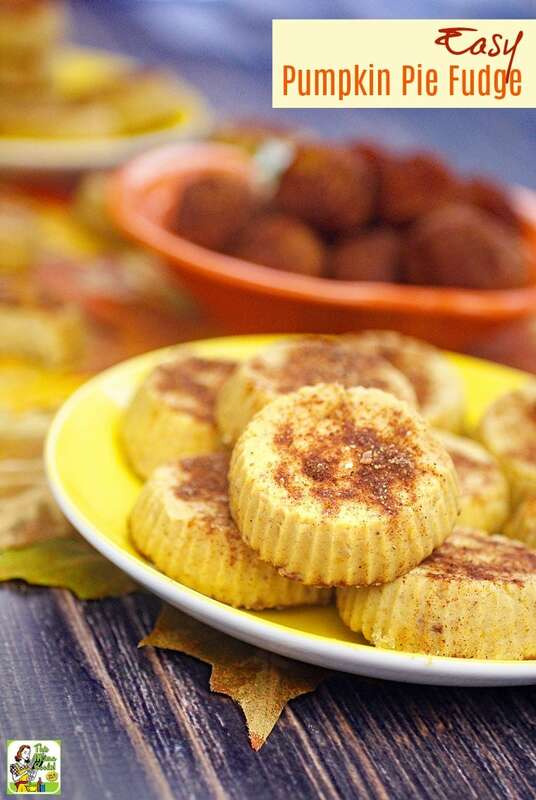 Sprinkle the top of the fudge mini pies with cinnamon sugar. Flip the mini pie on to a tray or plate. Sprinkle the bottom with more cinnamon. Place mini pies slightly apart on a tray or plate and place in the refrigerator to harden up for a few hours. Store fudge in a covered container in the refrigerator until it’s time to eat. Originally published on October 1, 2014. Updated with new pictures and information. Posted in Desserts, Gluten Free, Recipes and tagged coconut, dairy free, monk fruit, pumpkin, vegan, vegetarian on September 27, 2017 by Anne-Marie Nichols. Copyright © 2004 - 2019 by This Mama Cooks LLC. All rights reserved. This Mama Cooks! On a Diet® is a registered trademark of This Mama Cooks LLC.